After finishing high school and music school in Tolmin (under prof. Miloš Rijavec) was Damijan Valentinuzzi granted the Zois scholarship and started studying at the Faculty of Mathematics and Physics in Ljubljana, while also studying at the Conservatory for Music and Ballet Ljubljana under prof. David Jarh. After two years he decided to give his full attention to jazz trumpet and began studying at the University of Music and Performing Arts in Graz (Austria) with professors Eduardo Holnthaner and Stjepko Gut. In 2007 he graduated and immediately started his Master's degree. In 2008 he was granted the Ministry of Culture scholarship and began a one-year student exchange at the Jazz Institute Berlin (Germany) where he studied under Gerard Presencer, one of the best jazz trumpeters in the world, and Malte Burba who taught him the special trumpet playing techniques. In Berlin he worked also with the well-known Berlin producer Achim Gieseler and gained much knowledge about studio techniques and also many ideas about other directions and possibilities for improvisational music. After the year he returned to the initial university in Graz and graduated his Master's studies with prof. Jim Rotondi in 2011. During the study he attended numerous seminars abroad, where he had the chance of working with renowned jazz musicians, such as: Wynton Marsalis, Bobby Shew, Till Brönner, Andy Haderer, John Swana, John Abercrombie, John Hollenbeck, Jerry Bergonzi and Marcus Miller. As a member of the Graz university big band (KUG Graz Big Band) he played under leadership by eminent conductors and composers, such as Bill Holman, Bob Brookmeyer, Peter Herbolzheimer and many others. For four years before leaving for Berlin he was Big Band NOVA's conductor and he resumed the position since 2013. Since 2012 he has been also the conductor for Tolmin Wind Orchestra. 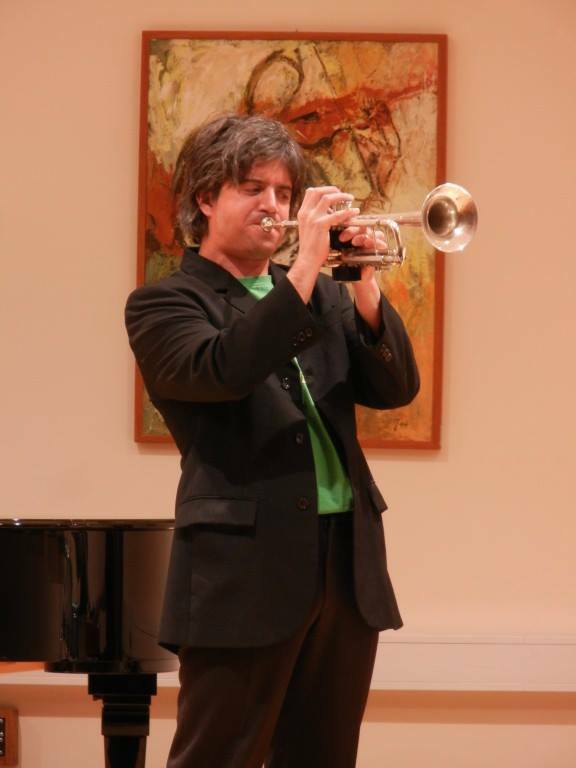 He is also a pedagogue: for three years he taught the trumpet at Tolmin Music School and currently teaches at the BASE Music School in Ljubljana. He is also the leader of the band Damijan Valentinuzzi Group, with which he creates original music that combines jazz improvisation with all that modern technology can offer. While he was studying in Austria a school reform happened and the study system at the Faculty of Mathematics and Physics in Ljubljana changed and brought with it a new program of medical physics. Damijan Valentinuzzi saw that as a challenge and while still studying in Austria decided to take up the new study of physics in Ljubljana in the study year 2010/11. In the autumn of that year he graduated the 1st Bologna cycle and started the 2nd in medical physics, finishing with the average mark of 9.65. In November 2013 he gained his Master's degree with the highest mark with his thesis titled Modeling tumour response to targeted therapy with anti-angiogenic drugs under the mentorship of dr. Robert Jeraj and dr. Urban Simončič. He did the research work with assistance from the Jožef Stefan institute (SLO) and University of Wisconsin – Madison (ZDA), with which he still continues to work.